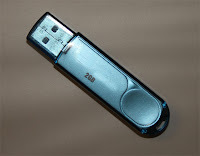 The Flash Drive, Pen Drive, or the Thumb Drive are all names I have heard them called. These are the most dangerous tool in your IT tool box. These little marvels of technology have made life easy for IT, the common worker, and even myself. Taking that important presentation (that is due in the morning) home is now just a plug, copy, yank, and in to your pocket on your way home in less than 30 seconds. The drives now come in a variety of sizes that will suit almost anyone’s needs, from 1GB for $5.99 for documents, pictures, and music to 32GB $59.99 that will transport six full length DVD quality movies with room to spare for documents, pictures, and your favorite mp3’s. The larger models could even transport a mid-sized company’s entire data base containing all of their customer’s information. Apperantly the drive was lost by one of their IT analysts (would hate to be that guy). And the data was password protected, but almost any thing could be relatively easy to crack these days. Now quite a few people are mobile and utilize laptops as well, if the company has its wits about them selves they should be using NT or XP Pro at the very least. But that is still easily bypassed as well with a Linux utilities disk but that’s a whole different article unto it self. The question to be answered is, how often does this type of thing really happen? With the size of these devices and the relatively low cost how easy are they to loose and how much would you miss a six dollar 1GB drive?